Creating Reports has been greatly simplified by using the new Dataset Reporting feature - see Dataset Reports Overview (New in 5.3). Not all charts are as yet supported in the new feature but will be added as requested. 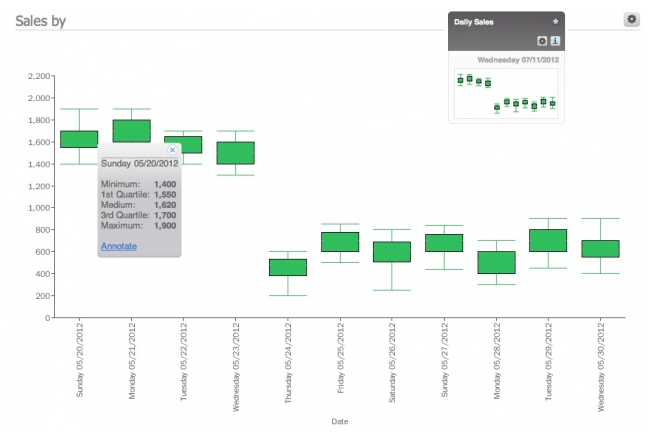 Line charts display continuous data over time, set against a common scale. 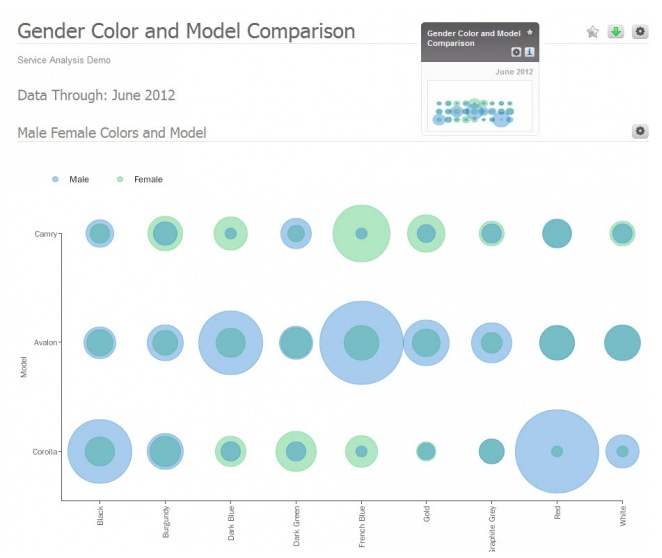 They are ideal for showing trends over time and are the most commonly used chart. If you are uncertain, start with a line chart. As a general rule, you may want to use a Line chart if your data is plotted using an X axis with date values. If your x-axis shows numeric or text values, it is typically better to use bars instead of lines since lines imply a continuous progression between points. A line chart is a good choice to show a specific computation on a daily basis, but it is not so effective when comparing two distributions or finding changes between distributions. 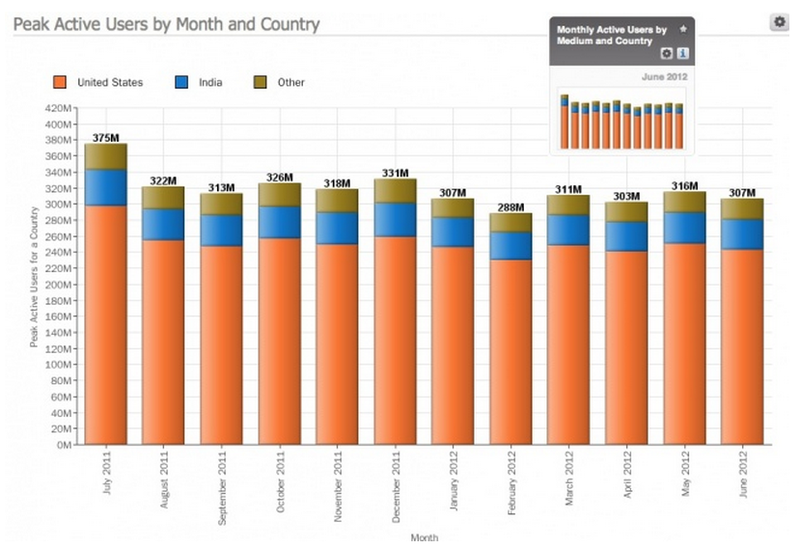 NOTE: Metric Insights' Report charts can display any combination of just bars, just lines, or both bars and lines. See Step 2.5 below for a discussion of Combination charts. This presentation is used with bars that are clustered (side by side), not stacked, and compares values across multiple charted elements. This is also useful when the different bars represent different measures; e.g., currency and units as in the above example. In this case, stacking bars would not make sense since sales and units are different measures and the additive combination of these two measures is not meaningful. In this format, the viewer can assess a trend in a total value as well as see how individual components contribute to the trend. It is only relevant when all bars share the same measure. While this display format has the advantage of presenting the total clearly, it is much more difficult for the viewer to perceive how each individual bar changes as X axis value change. As an illustration of the trade-offs between Clustered and Stacked Bars, the two examples provided. In the chart above, it is fairly easy to compare values of a single bar from month to month; however, it is not possible to determine whether the overall total is changing. In the chart shown above, the bars are stacked so the overall trend from month-to-month is clear. In comparison with the first example, this approach is more difficult to discern immediately how an individual component of the total (a country value) has changed from month to month. 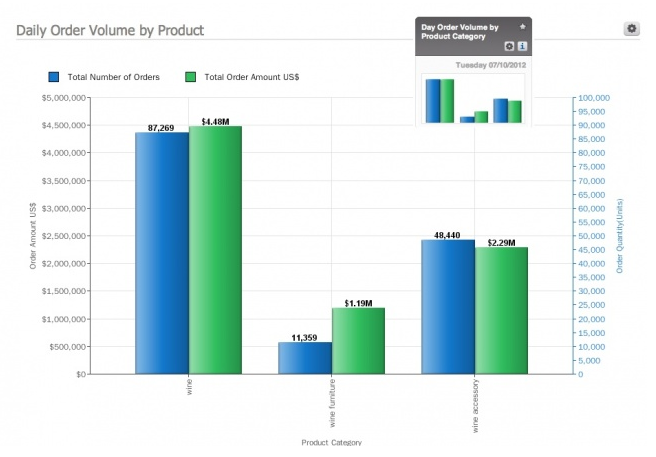 Bar charts can also be displayed with a vertical X axis to take advantage of the landscape chart feature in Metric Insights in order to improve the visible differentiation between bar values. 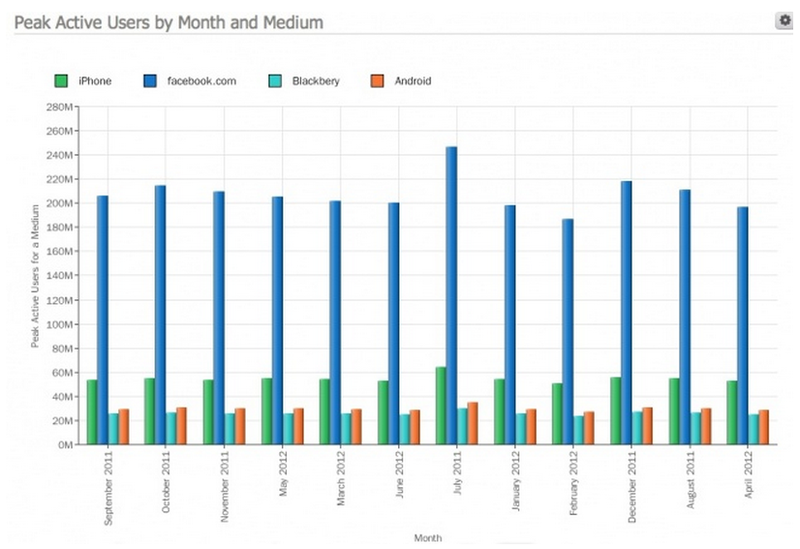 The example above illustrates a stacked bar chart in which the X axis is vertical instead of horizontal. By combining bars and lines in the same chart, it is often possible to see trends more clearly. This is especially helpful when the chart contains a fairly large number of points. 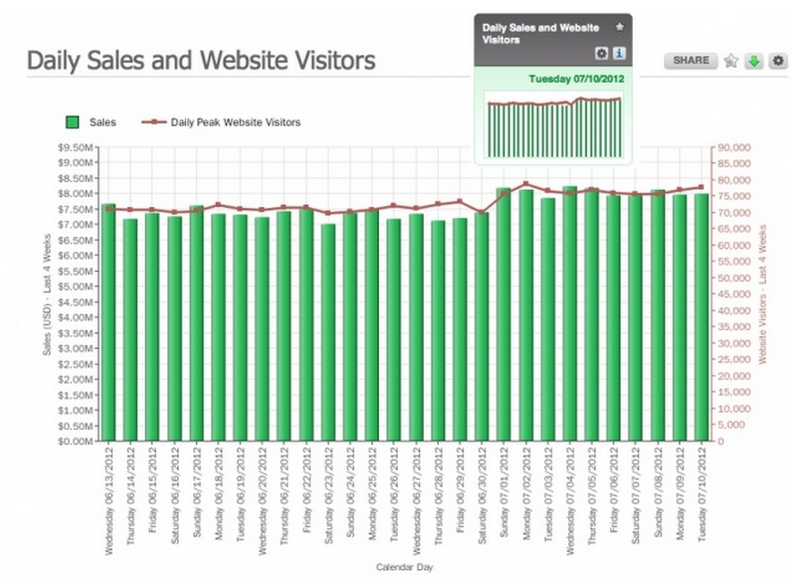 For instance, in the example above, it is much easier to see the trend of the daily sales compared to website visitors shown with a bar/line combination chart rather than using just bars. A Pie Chart is used to display the contribution of each measurement value to the whole represented by a circle with wedges. Formats are available using either a 2-D or a 3-D visual effect. 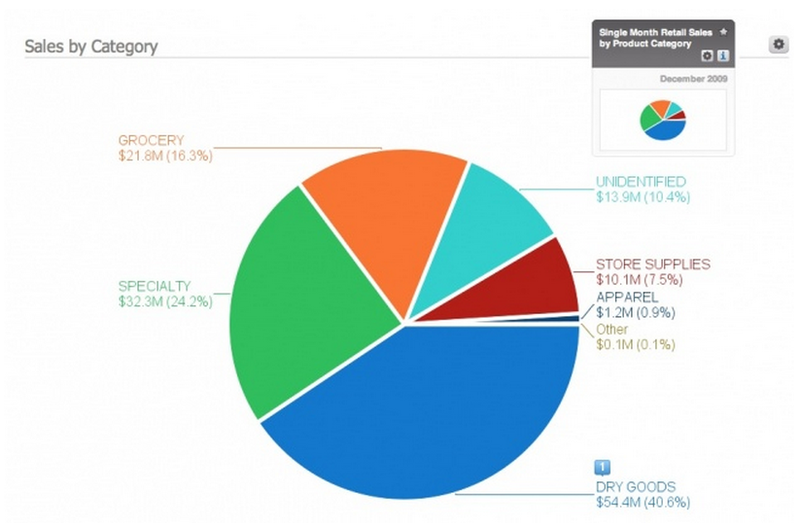 Pie charts are often used because they are very familiar to viewers and immediately communicate that the user is looking at parts of a whole. In Metric Insights, it is possible to show the top ''n'' values contributing to the whole and sum the remaining values into an ‘Other’ slice. For example, above is a 2-D chart, the ‘Other’ slice may represent a very ‘long tail’ of values. By Default for Pie Charts, the system automatically groups excluded items in the 'Other' slice. A Pyramid Chart has the form of a triangle with lines dividing it into sections. A related group of data is placed in each section. Because of the triangular shape, each section is a different width from the others. A Pyramid chart is similar to a pie chart in that it typically represents parts of a whole; however, the stacking of the individual pyramid slices also denote a level of hierarchy among the data. 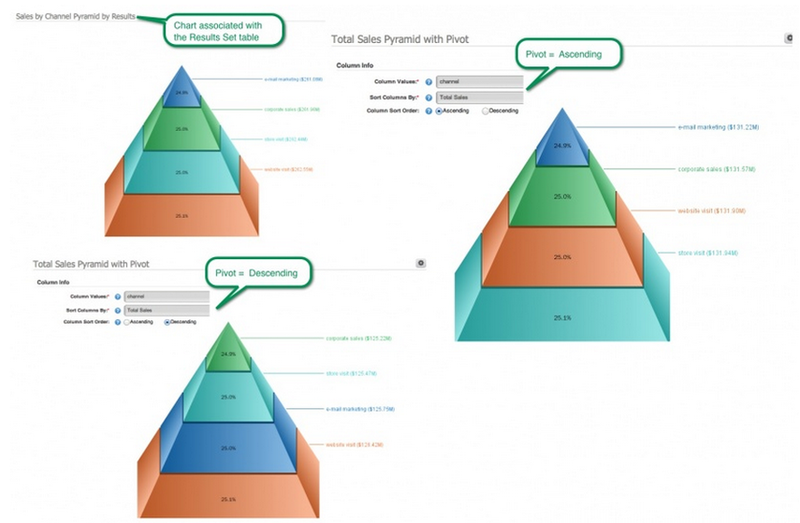 You might use a Pyramid Chart when Internal Report data needs to be arranged in a way that shows hierarchical structure, as well as quantity or size. This could include such groupings as employee positions, products sold or business locations. The value of items in the pyramid, from top to bottom, must have a progressive order. The sample Pyramid chart depicts the number of employees by organization level hierarchy. The image shows the various renditions of the Pyramid . A funnel chart displays values as progressively decreasing proportions. The size of the area is determined by the series value as a percentage of the total of all values. A funnel chart is a parts-of-a-whole chart just like a pie and pyramid chart. Unlike a real funnel, everything that is "poured in" at the top doesn't flow through the bottom. The name only refers to the shape of the chart, the purpose of which is illustrative. Typically, a Funnel chart is used to illustrate a process that starts at 100% and ends with a lower percentage in order to identify the stages in which fall out occurs and at what rate. 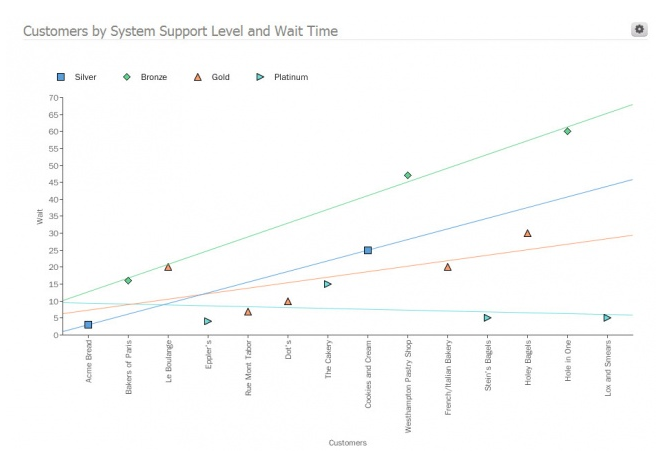 The funnel chart help determine where the biggest bottlenecks are in the process. 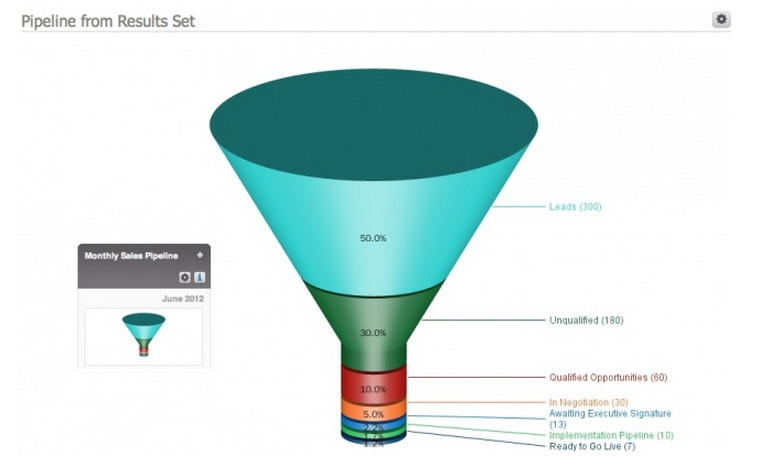 Funnel charts may be used to represent stages in a sales or registration process. In the case of sales, it will show the amount of potential revenue for each stage. 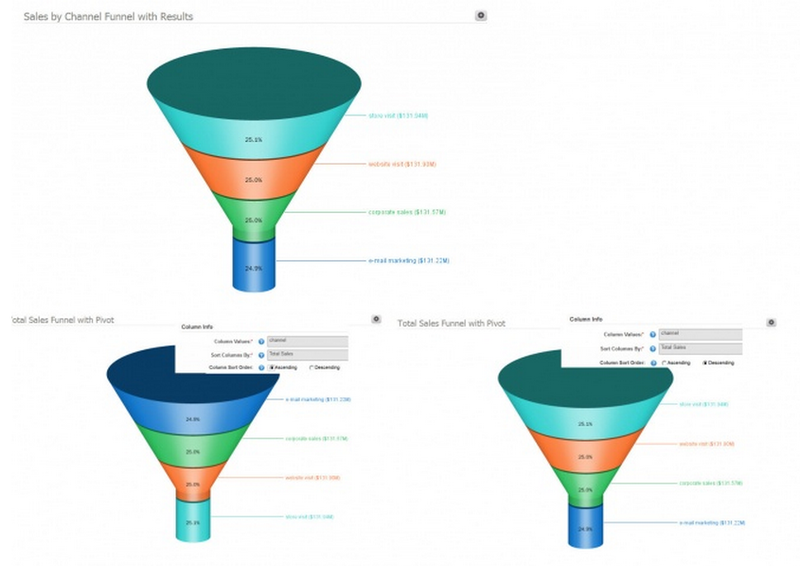 With a measure such as web registrations, it would depict the number of users in each stage of the registration funnel to help the viewer understand attrition in the funnel. This type of chart can also be useful in identifying potential problem areas in an organization’s operations. 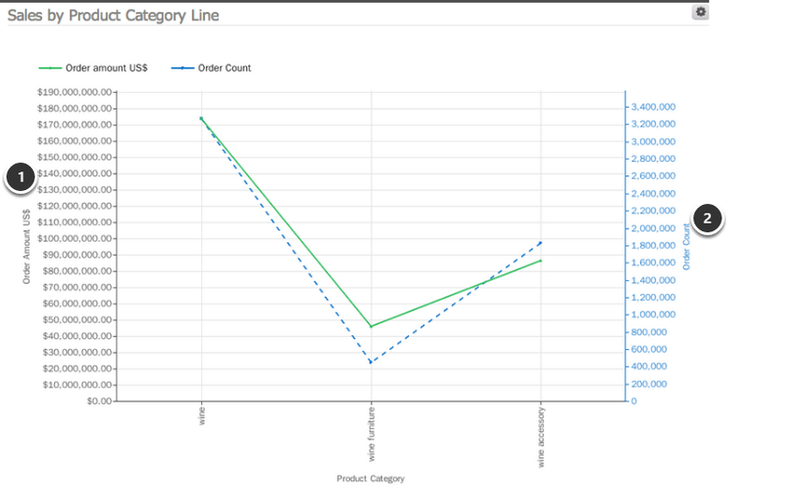 Scatter Plot charts compare pairs of values and allow you to plot many data points on the axis in order to visually determine how X and Y data is related. The purpose of a Scatter chart is to find some relationship between two groupings of data. This type of chart can be displayed with or without straight lines showing the general trend line for the data. The sample above does not have a trend line. 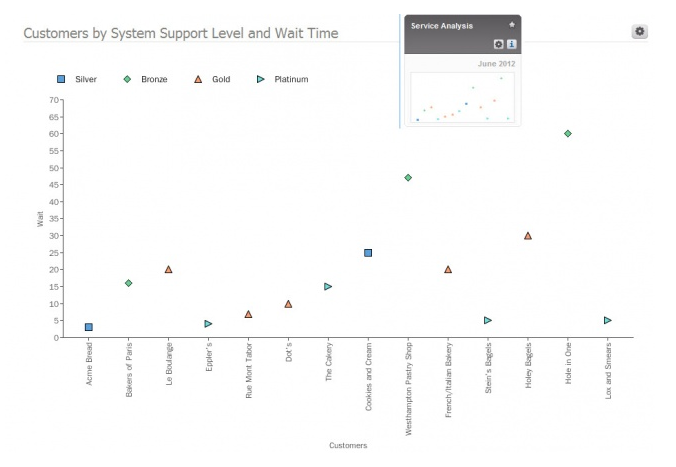 It illustrates how customer satisfaction scores correlate with the amount of time that a customer waited to receive support. A Bubble chart is a variation of a Scatter Plot wherein the data points are replaced with bubbles. This method is useful when it is necessary to visually identify the magnitude of a given measure for something that is plotted across a set of X and Y axis values. A bubble chart can have multiple sets of bubbles. In a Bubble chart, the size of the bubbles is determined by the values in a third data series. Bubble size is set so that area (not diameter) of bubble is proportional to value plotted (i.e., a data point with 2x the value would have a circle with 2x the area). If you wanted to show the relative popularity of different colors of cars, you could do so with the chart as illustrated above where the size of the bubble shows the relative number of cars purchased by males and females, depicted by color and model. Having a bubble chart with a huge number of data points does not make sense because it will not communicate anything useful. A Box and Whiskers chart is used to show a distribution of values along the Y axis for a given X axis value. You must have all of the columns listed below in the Internal Report's result set; i.e., you must collect the five statistical values in the list that follows. When your system is configured, you may name these fields to meet the needs of your business. 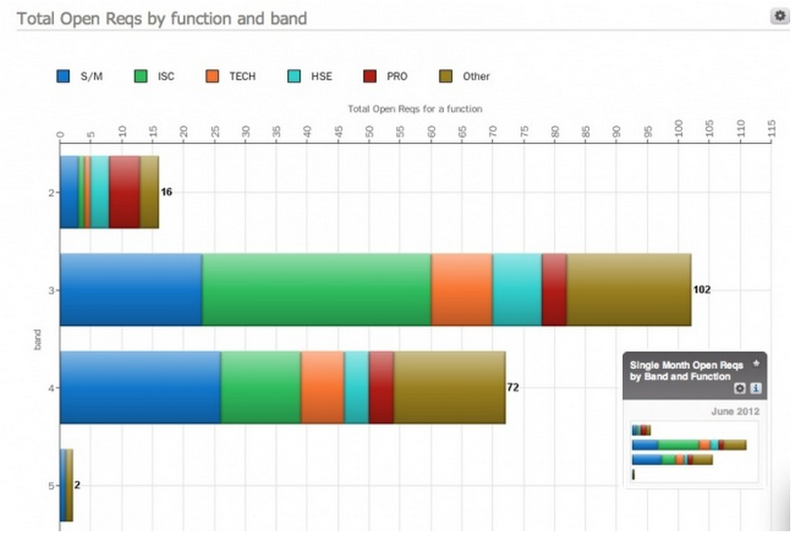 Note: You cannot base this type of chart on a Pivot Table. The image provided illustrates sales statistics (by quartile) for each day included on the chart. 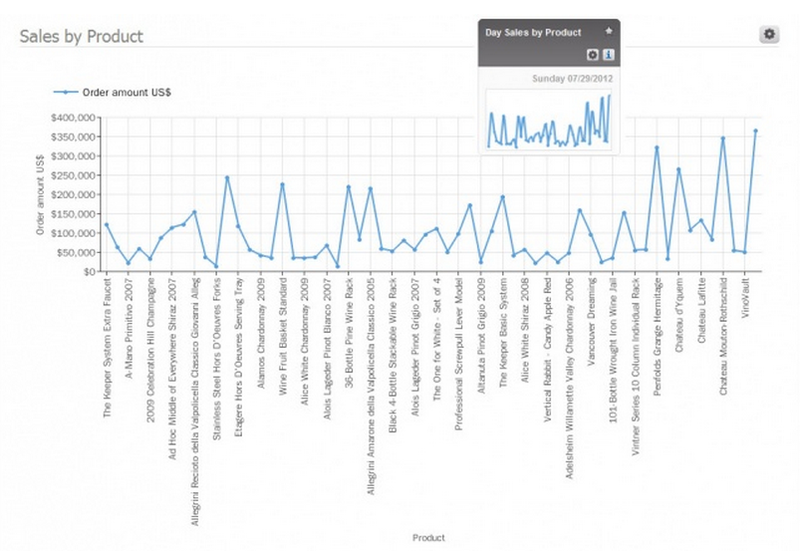 This allows the user to see the sales distribution for any specific day.